Technology and competition is dramatically changing the way that Restaurants operate. We look at how these 2 mega trends are creating the 7 big Restaurant Trends 2017 for owners and chefs. We have identified 7 major trends that will change the Restaurant industry in 2017. 1. Restaurant Home Delivery – there has been consolidation with the online ordering companies like Just Eat and Delivery Hero, and new entrants like UrberEats providing delivery for Restaurants who would have never thought of doing delivery 12 months ago. On top of this – we have Drones and Self Driving Cars – this technology is going to provide a lot of opportunities for Restaurant Owners. 2. Marketing – It is becoming really hard now to not have a strong marketing strategy for your Restaurant, along with great execution. You don’t want to have the best restaurant that no one has ever heard of – because it is increasingly likely that you will go out of business if you do. 3. Bigger Data for Small Restaurants – using Facebook and Comparative Analytics are a powerful way to use big data for small Restaurants. 4. Automation – the rise of the Restaurant Robots. Rising wages and increasing costs are meaning that more Restaurant owners will turn to automation to cut costs. 5. Consolidation – For a small restaurant, going to 1 Restaurant to 2 is the hardest move, but it starts you on the path to get those economies of scale. 6. Specialization – It is becoming increasingly difficult to run a generic cuisine based restaurant. Many Indian or Chinese restaurants are struggling unless they are starting to specialize and give customers a reason to be loyal to them. We look at some of the areas that Restaurants are going to be moving into. 7. Divergence – Restaurants that have their strategy in the middle of the profit mix will struggle – they will either be pushed to build a Restaurant built around low price, or specializing to create value in niches. Being a good restaurant with nothing specific will force you to start competing on price and that will make it harder for you to retain your quality. 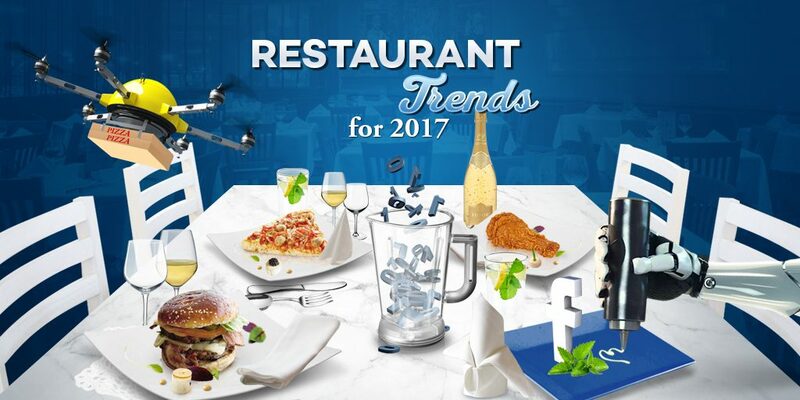 If you want to read about the changes, check out our in depth report on the Restaurant Trends for 2017. For your Restaurant to prosper in 2017, you need to be educated. Check out our best Restaurant podcasts of 2016. There are 19 must listen to podcasts from the thought leaders of the Restaurant Industry. Look at the free tools to market your Restaurant and start to differentiate your Restaurant from your competitors. James: Welcome back everyone and Happy New Year! It’s New Year’s Eve as I sit here in the Marketing4Restaurants headquarters and it’s a glorious sunny day here in Melbourne which is a lot better than it was 2 days ago where we had flash flooding. Which was very interesting for us ‘cause we ended up with about a 150-square-meter indoor lake which was not exactly what we planned for. So, that was quite interesting I know that we are based in Melbourne in Australia and I know we that there were quite a few restaurants too who had issues with servers that night because of the fact there was just rain everywhere, it bucketed down. So, anyway, on with words, how did everyone go with Episode 32? (Secret Sauce episode 32: The five levers for Restaurant profitability and five ways that you can change them) Got a lot of really good feedback on that podcast really these are simple levers and I think that is the most important thing with that they’re simple levers which means that they’re really simple for the ear to be able to be utilised sometimes without any budget at all. They are the important levers the ones that you can pull without actually spending any money. A few little bits of interesting information going about what we’ve been doing at Marketing4Restaurants. Super excited for FROLO, the free restaurant online ordering system. We have now got some printers out in the market place, so we’ve got restaurants who are getting orders online they’re taking those orders from their own website completely for free and we’ve now got our printers working for them. So, I know to get your workflow right in the kitchen a lot of people have really needed printers and now we’ve got them so that’s super exciting. We haven’t worked yet how commercially were going do that how were going to sell them. We’re looking at that in the early weeks of January. Planning on rolling them out fairly aggressively, big thing a lot of people have been waiting for. Your redemption rate so those people who bought the gift cards, not all of them are going to come in. So that’s just free money that goes into your pocket. They’re pre-paying which is great for your cash flow. Email database. Each one of those people when they get their gift card you’re going to have to get their email address. It’s building your database of people who wants to dine in your restaurant. That’s perfect for remarketing! So super exciting there. Now, on to the Restaurant Trends 2017. What we’ve been doing is, throughout the year we have been taking note of all of the things we’ve been seeing with our customers. A lot of our customers we have talked to says: what do you think of this idea? what do you think of that idea? We’re thinking of doing this because of this, we’re having problems with that, were going to try this. These are all of the kind of things that we think are interesting and it’s taken from around the world. So, customers in the US, in the UK, in Australia, New Zealand. We’re seeing a few big magic trends that are driving some big trends in the restaurant industry. And so what we thought we’d do is we’ve written a blog article and were just going to put all of that into a podcast so that all of our podcast listeners can listen and get a really good understanding of what the trends are going to be. I’m a big believer that if you can spot a trend early, then it gives you the ability to sort of plan for that trend be an early adopter and really get the most benefit out of it. The scary thing with some of these trends is that they’re going to fundamentally change the profit dynamic for a lot of restaurants. When we talk of these trends some of these things are already happening, we just think they’re going to be more amplified in 2017. So, these are already having an impact on some peoples bottom lines. Some people who are ignoring those trends, or the trends are working against their business plan, they’re having problems with profitability. Some people who are riding these trends, they’re doing really, really well out of it. And that’s the kind of thing that you want to be thinking about. I know how are these trends going to impact my business because understanding those trends: this is the thing where you can increase your revenue, increase your profitability, increase productivity. All of those go to the end goal which I think for most of our customers is to be able to run a really profitable business where you’re not actually killing yourself working 80 hours a week. You can actually work a really civilised 40 hours a week or 20 hours a week. How awesome would that be? With a few overseas holidays thrown in there. That’s the kind of thing that you want to be thinking about, and I think that a lot of these trends are going to place you in a position where you are going to be able to do that. So, the two big meta trends that were seeing are increasing competition and increasing technology. Now I know what everyone’s going to say, “Wow, competition has been around forever in the restaurant industry.” Absolutely, I completely agree with that. It’s getting a lot more cutthroat though. I think everyone needs to realize that. We did some work with some case studies for some restaurants a few weeks ago which was great because I got to sit down with the restaurant owners for an hour and we just sort of talked about their business. And really sort of knot out how their businesses were going and the kind of things that they were saying and the one thing that was common amongst all of them. And so, we did one was a souvlaki bar, one was a fine dining Indian restaurant. and the other one was a Greek restaurant, competition. Just a lot. How far in the last 12 months to be able to be profitable and some of these guys have been in the industry for 15, 20 years so these guys have a really good idea about what the industry is like and the changes that they have seen. I’m not just talking about more restaurants competing, so you’ve got a whole range of things like, there’s competition for food. Some people might go out to a sports event, they might eat at home. Home delivery is creating a large amount of competition, cause a lot of people actually spending their money now on having food delivered to them. We have a lot of these companies that are interposing themselves between you and your customer. So, companies like Menulog, Just eat, Grub Hub, Dimmi, Open table all of these guys are really trying to get into between you and your customer. That is competition, these guys are building their marketing databases, they’re competing against you because you want people to eat in your restaurant they want people to eat in a restaurant or to get food delivered from a restaurant. They’re not really that fussed about where that comes from because they’ve got thousands of restaurants in their database and hundreds of thousands of customers. It’s about building that database for them, it’s about building that big data opportunity they’re not overly concerned about you guys. And I think that this is one of the things, this is part of the competition that were seeing is that people are letting go of their relationship with their customer. We’re going to talk a little bit more about that. Technology. Wow! There is so much technology that is coming out, so this is one of the meta trends, Technology. We’re going to talk about technology in so many different of these seven trends as we talk about them because it’s the technology that’s the game changer. It’s the technology that’s feeding into some of the competition’s opportunity / threats that you’re saying but it’s also flowing into a lot of these other trends. I think that it’s a hugely exciting opportunity for most restaurants because there’s so many things that you’re able to do that you weren’t able to do even five years ago, even one year ago. So, lets crack on then. The first one we’ve already talked about it, Restaurant home delivery. WOW! how much has changed in home delivery in literally the last 12 months. One of the things we talk about at Marketing4restaurant is how exciting it is because at the start of the week we’ll say right this is what our plan is and then it gets completely gets up ended. Four hours into the week because something like, the most recent thing that happened was in Australia, Delivery Hero exited the Australian market. Now, this is something that we foresaw, it had been on the cards for quite a long time. Delivery Hero is the main brand, they’ve left. They’ve left Fedora but we don’t really see Fedora as being a significant player in that market space. Everyone that were talking to, saying that Uber Eats is just carving it up. Deliveroo we think is doing a little bit better but Fedora was struggling to find restaurants who were getting good volumes out of Fedora. Everyone’s using Uber Eats. Just in the home delivery space there’s so much going on. In Australia, you’ve only got Just Eat, through them Menulog brand which was once Eat now. You’ve only got one player, what we sort of call the version one type businesses you know your Grub Hubs, your Eat24’s, your Delivery Heroes, Just Eat. They’re the guys who take an order and send the order through to you. Now, we think that this business model is pretty old hat. They’re not giving you the email address. They’re charging significant commission for it and there’s a lot of easier ways. This why the free restaurant ordering system came into being. people just wanting to be able to take orders online they’re needed to be able to build their database. That’s super critical. All of the version one guys they’re sort of like, they’re sorting themselves out. So, Just Eat bought Hungry House and Skip The Dishes, Delivery Hero bought Food Panda so what your seeing is literally just one of them in each market now. Now, because its only one that’s going to allow them to increase the commission that they charge. And we think that’s one of the factors that going to occur next year will be an increase in the commissions that these guys are charging. If you look in Australia, Just Eat paid $865 million dollars for Menulog it was a priced for earnings to ratio, I don’t know, crazy like 271 to 1. That’s insane particularly when you think that those guys had pretty much most of the market. I’m not sure that they have added, they haven’t doubled the number of restaurants that they’ve got on their books. For them to be able to get that, normally it’s like a PL ratio you’re normally looking at a ratio of 10 to 1. They need to increase their profit, massively. So, commission is one of the big things that they can do to do that. Now this is only the start of the story, then you’ve got Uber Eats and I’ve spoken to restaurant owners that we had breakfast at a restaurant a couple of days ago. It was pretty quiet and we were so excited. “Ah, you’ve guys have done a lot of work here, how is it all going? The guy said its going really well. Yesterday we did 85 orders through Uber Eats. This is the kind of divergence, these guys spent a fortune on fit out. We think that there’s going to be a rise in the delivery only restaurant. No fit out, you’ll be in a commercial area where the lease is going to be a lot cheaper and you can just focus on commercial delivery. So, no front of house staff. You’re going to be able to cut your costs significantly and produce really, really awesome food offering. So American Barbecue, they would have never thought of doing delivery. I don’t think because the logistics is a really, really tricky part of delivery. Uber eats, Fedora, Deliveroo they’re doing the logistics part force. All you have to do is put the food out front and someone picks it up and takes it away and they’re going to deliver it to your customer. Now, of course it’s the margin that they’re taking and you’re not getting the email address. There’s a few things you need to think about, in your business plan, in your marketing plan (See: Secret Sauce episode 34: Creating an Annual Restaurant Marketing Plan) but regardless to what you think about it, it’s changing the dynamic of the dining market. How many of these people are ordering in when they would’ve gone out? Really interesting question, obviously, some people wouldn’t have and particularly like when you’re thinking about breakfast. So, we were there for breakfast and there were people getting orders for brekkie. Maybe too lazy to get out of bed, they want the convenience of having their food delivered to them, that’s awesome. Not all of those people wouldn’t come out for a meal but some of them would have definitely would’ve come out for brekkie. So that’s a thing that’s making a big difference. The thing that’s even more so, and this is the thing that makes delivery such an exciting space you’ve got self-driving cars and you’ve got drones. So, all those guys pushing bikes and the Uber eats guys driving and it’s interesting, one of the things that were seeing is that Uber Eats in Australia they’re using a lot of bike riders as well, they’re not branded. They’re in a black box which are, I’m not sure why they’re trying to avoid that branding opportunity because you see the Deliveroo guys and a few of the Fedora guys around not seeing the Uber Eats guys, which is an interesting sight. Self-driving cars are going to make a massive difference to this as well. Now, Self-driving cars, you’re thinking well this is going to be a long way off. is it? is it really? Elon Musk tweeted a video a couple of days ago of a Tesla driving along and all of a sudden it starts beeping and braking and then. So, it’s braking and you don’t know why its braking. And then the car in front of the car in front of these guys driving along has an accident. The car in front swerves out of the way. This Tesla is braking before you can even see that there’s a problem. Obviously, their radar has picked up that there’s an issue and has started reacting. Elon tweeted a while ago, anything that stands in the way of self-driving cars is killing people. It’s these things that are really going to drive that dominant narrative and governments are looking for ways that they can save budgets all over the place. Healthcare and building roads, these are two areas self-driving cars are going to make a difference. I expect to see so much happening in 2017. A lot of people are like we don’t really think that that’s going to happen. They only need to look at what happened in 2016. With both drones and self-driving cars to see this is going to be a big thing. I think the early adopters are going to make a huge advantage because its going to democratise delivery. It’s going to do what things like Uber Eats are doing now. Potentially it’s going to allow restaurants to do that themselves. So save on that margin, it’s going to be a big, big change and I think that’s its super exciting. We have to see here how it pans out. Marketing, A few of the local restaurants and a few of the restaurants in Melbourne that we really like closed down this year. We went to some of the restaurants that have been institutional local restaurants. You know those restaurants that everyone in the local area has been to and they’ve been going there for like 20 years. Some of them are in pretty bad states of repair. You can just tell they’ve got that stink about them of a restaurant’s that has probably outlived its life. This is because marketing is becoming such a critical component. So many restaurants these days, we still come up against restaurants who don’t have a website or they’ve got a website that is 5 or 10 years old. And they just look completely horrid. They do absolutely nothing to drive any customers to the restaurant. And so often we are seeing, restaurants where everyone’s going, oh you’ve got to go to this restaurant it’s amazing! And you go and you think, “Wow, that was really expensive! The food was adequate at best and the service was pretty ordinary. Why are people raving about these places?” And the answer is marketing. Some of the things that we have seen this year: We were able to fill a restaurant in Perth on a Sunday morning for I think it was $8.38! Everyone was ordering pancakes, which was their highest margin item. Now, that was $8.38 spin on Facebook. A really simple campaign, we’re going to be seeing more and more people doing these things because less than 8% of small restaurants are posting every week on Facebook and only 2% are running Facebook ads. That is just madness! A classic example of that is these: I like to refer to them as the “Death Shakes,” the one with a litre of milk and a whole heap of crazy junk on top of it. So, a whole heap of cream and then chocolate and then biscuits and then probably a waffle and then some bacon and then maybe a meat pie or something completely crazy. Doing all sort of weird things and they’re just absolutely crushing it on Instagram. Now, these Instagram led menu items, and whether you like that or not, and I personally think that it’s a little bit crazy. They’re very one offish. I find, but that is a trend and it is drawing people in. We went to one three of four months ago, 4:00 on a Sunday afternoon. It was a 30-minute wait to get in to a place that serve pretty much milkshakes. It was a bakery, but that bakery had transformed to do milkshakes. Quite faddish but you have to understand that this is what you’re competing against. And it’s just really sad when you talk to people and they say, “I’ve been running an Indian restaurant for 20 years and its getting really tough and we don’t know what we’re going to do.” Well, you need to innovate. I think we’re seeing the end of that cuisine led restaurant. The place that is just your generic Indian restaurant you need to have something a little bit more. We’re going to talk a little bit more about this and a couple of the other trends. Next, Big Data for small restaurants. So, big data they talk about large volumes of data coming in very quickly and all different types of data. And then sort of trying to analyze it and work out interesting trends, information or things that you can do marketing around. By definition, a small restaurant is never ever going to have big data. But there’s a couple of things that people are doing that is giving them access to big data trends. And it’s really making a big difference in their business. There’s a couple of things, like comparative analytics. For all of our customers using Free Online Restaurant Booking System (FORBS) or Free Restaurant OnLine Ordering system (FROLO); or with the website. First, we send them a report every week. We say, you compare, you’re in the top 10% or you’re below average for these metrics. Now, were taking their data set and were comparing them to a much, much, much greater data set. A big data set which allows them to think, “oh Wow, were doing well in this place!” or, “Oh, my God were awful in this space!” What can we then do to improve on that? And that gives them so much more insight to where they should be doing their marketing. Another thing that were seeing is that they are using Facebook’s algorithm. So, Facebook is probably the biggest database that you’ll ever be able to work with, unless youre working in the NSA or somewhere super secret. It’s hugely powerful database and you get access to it for literally pennies. Very, very small, small budgets. We’re seeing people who are designing their budget based on Facebook (See: Secret Sauce episode 27 – Emergency Facebook Marketing for your Restaurant). What would you think of this item? Would you prefer to see this or this? And they’re running ads to it. And then they’re looking at how expensive those ads are to run and that’s giving them insight as to what is going to work better for them: as a menu item, as an item they can market. That is a really good use of big data. To be able to drive better innovations in your menu. We’re going to see a lot more of that as a lot more restaurants and were going to be talking a lot more about over it next year because we think that its a really, really powerful way than rather than just putting something up on the specials board and saying we hope you like this. You can be a lot more strategic in a way that you position your specials. And a lot more strategic in the way you rotate items through the menu by using the big data that is out there. Automation, now. So, we’ve got the rise of the restaurant robot. Now, I predicated this on Early last year. We talked a little bit about sushi trains. Sushi train is one of those businesses where there’s a whole heap of Japanese food that comes around and there’s a little train pulling it. It decreases front of house staff they can focus on producing really good food at a price point that makes sense for them. Now, they’ve been successful. They’ve been around for 20 years. So, that’s an example of automation. The other thing that I find really interesting about this is that when you talk to restaurant owners they go, “Ah, I don’t really think that automation is going to be a happening thing!” So, let’s go through the deliveries that you get it in. And I’ll have a lot of food that’s been pre-prepared and that’s like, “So, do you not think that you’ve got automation in your restaurant? You’ve just outsourced it to someone who, can get that in economies of scale.” A lot of those producers, if you’re buying pre-prepared food they’ve already got automation. They’re not sitting there individually cutting this stuff up and then cooking it. They have automated lines to produce this product. What you’ve done is you’ve outsourced that automation. The trend that were going to see though, I think is that now as the price of that automation is coming down, it’s going to come into the restaurant. There’s a lot of interesting things, so this Pousteady that they’re doing coffee. And I think that coffee is kind of a no-brainer. Royal Caribbean has got a really, really interesting robot bartender system. And the interesting thing about these systems is that you can create amaretto sour or I want a Gin and Tonic and it will create a Gin and Tonic for you. Or you can say, you can create your own cocktail. Just straight off the top of your head. You can go through and make that recipe and it will make it for you. You’re creating, it looks kind of funky that robot bartender. You won’t do that. I think that’s interesting, that there’s also a company called Momentum machines. They’ve been talking awhile about burger making technologies. Being able to flip burgers, they were meant to appear in 2016. I haven’t seen them yet. Not too sure how far off they are. The interesting thing about that is that you can design your burger and it will get cooked on the fly. We’re talking about really interesting ways that you can design that burger though because you can design the patty. What kind of meat in it, what percentages of the different kinds of meat that are available you want in your patty. You can design that on the fly and it will be cooked for you bespoke. Really quickly, super fresh. They’re talking about, one of the things I really like about this system is that they’re talking about being able to cut the tomato just before it goes on the burger. So, it’s not going to sit there in a bin for 4 hours. This is going to be super, super fresh. This is going to be one of the things. And, so, when we look at the automation, that some of the automation is going to be in the kitchen, where no one is ever going to see. Because of the aesthetic of this, some of it is going to be brought out and it will actually be a part of the experience for your customers. Kind of like the way that Krispy Kreme does it with their donuts. A really, really interesting space. You’ve also got the Moley Robotic kitchen, they’re still a little way off. One of the things that they did there was really, really interesting, was that they got someone from one of the Masterchef shows and he cooked a recipe for a, I think it was a Seafood bisque from memory, had a whole heap of sensors on his body and what they got was two robotic arms that can mimic those actions. So, you’ve got this robot that is recreating a Masterchef environment and the aesthetic there is quite amazing that’s the kind of thing that you could potentially see. That’s probably a little bit further off but definitely we’re going to see more automation. This being brought around by increasing wage costs. There’s no two ways about it. Wage costs are going up, this is a really interesting way that some people are going to be dealing with it. Now, Consolidation. In Australia, you’ve got Urban Purveyor Group bought Rockpool Group to create the Rockpool Dining Group. 47 venues, 15 brands Revenue of $350 million and over three thousand employees that’s really quite massive. I think that we’re going to see more consolidation because of the fact that competition is getting tighter. It’s going to be harder to run a single location restaurant, I think. You’re going to have to be really, really, really switched on to things like your marketing, your cost controls, your wage bill, all of those sort of things. It’s hard to get the economies of scale around the management capability that you need to be able to do that. So, I think the big groups are going to get bigger. The interesting thing about Urban Purveyor, is that as I said they’ve got 15 brands. So, they’ve got a lot of restaurants there that are one, two, or three locations. The question I’ve got though is how do you go from 1 to 2, because if you don’t have the profitability in one restaurant then obviously, the thing you could do is to open a second restaurant. Then you start to get some interesting economies of scale you’ll be able to negotiate better prices from your suppliers because you’ll be buying more. You’ll be able to start getting in those kind of skills in Urban Purveyor group they’ll have a whole HR department. They’ve got 3000 employees. So they’ll have an HR department which means their hiring processes will be rock solid. Their firing process would be rock solid. That’s the benefit of going from 1 to 2. There’s a couple of things that you need to be able to do that though. You need to be able to build a strong culture, you need to have some really strong systems in place and you need to have some great people. The really interesting thing if you’re running a single location is that there’s a whole heap of technology tools that are out there now. And the thing that’s amazing about this is that some of these tools are free. So you got things like Confluence, Slack, Zoom, IP cameras. All of these tools enable you to be able to put things like your policies and procedures in place to communicate across locations, to communicate across a team environment where it’s difficult to get everyone together for a single meeting. You can use tools to be able to create one great company culture. To be able to build that sense of purpose in your team. One of our customers in Perth, he said to us once, I run three restaurants and I’ve been doing it for 15 years. The thing that I find really annoying though is that I’ve got 1 great restaurant and 2 really average ones. The funny thing is that, it’s always the restaurant that I’m in that’s doing really well. And that was because of the fact he didn’t have systems in place. He didn’t have a culture across the whole group, that meant that he didn’t need to be there. So, I think that we see people who are working 60 hours a week and then they take on a second restaurant. To me, that’s madness. What you need to do is you need to be able get to a point where you’re working 20 hours a week and then you can open a second restaurant, because you then got the time to be able to devote to it. The interesting thing is I think 1 to 2 is probably the hardest, 2 to 3 is a little bit easier because you’ve already probably got the systems in place. When you’ve got 3, there’s probably nothing stopping you from going to 10. We want to do a whole lot of research over the next year about how do you go from 1 to 2. We want to help you make that step from 1 to 2 ‘cause I think that that’s got to be the hardest step and that’s the thing that’s going to be so exciting from a profitability point of view for you, as you do that. I think as you get bigger you’ve got access to more of the resources that you need to be able to grow your business. Now, specialization. We talked about the end of the cuisine niche, you know your normal Thai restaurant, in the old days you used to be able to get by with just cooking Thai food or Indian or Chinese or whatever that cuisine was. That is becoming so much harder to do now and I think that there’s a whole heap of reasons that we’ve been talking about the increase in competition is making it really difficult to be able to do that. Which is why we’re seeing people looking towards specialization. Whether they go super niche into say like a burger joint but they’ll have a couple of other niches in there so what is the vegan strategy for your restaurant: what is the produce strategy, where do you get your produce from? Is it a family restaurant? In the old days, it was okay to throw some coloring books to the kids and say we’re a family restaurant. You can have a couple of high chairs, as well. There are people who are really doubling down on that strategy, there’s a play area for the kids, a lot of work has been done on the menu for the kids. We’ll definitely see people going to delivery only, that’s going to be a happening thing. My biggest fear is that at the low end you’ll see factory restaurants, where they’ll do five or six cuisines and they’ll have one or two chefs doing that. They’ll have five lines, so they’ll do Chinese, pizza, fish and chips, burgers, Thai and Indian all in one restaurant. They’ll have 5 or 6 different brands and they’ll all will be done through the online ordering systems. And it will be in a factory location. So, their rent is going to be a lot cheaper. Their wage costs is going to be a lot cheaper. Their food is going to be cheaper. It probably won’t be great food. They would probably cut down on those food costs, but they will be selling convenience and that will be their really big specialty. They won’t do dine-in. This is one of the big things we think will happen. Community restaurants will become a lot more popular. People really trying to create that sense of belonging and doing that through their restaurant. We have been reading about the social impacts of social media. And people are becoming increasingly disengaged from society because of the fact they’re spending a lot of time on Facebook. We’re Facebook marketers so I think it’s interesting to look at it when you’re a Facebook marketer, but for me I think you can use Facebook to actually advertise an alternative to Facebook. Using local produce, so use the network of the local producers that you have, to grow your network of regulars. Co-marketing activities with all the local businesses, the typical one that you’ll do is the local cinema but there’s so many more other local businesses out there. People are becoming increasingly creative so that they can leverage those networks and create a win-win situation for the other businesses. Menu items that highlight the local focus of the restaurant. Who are the local identities? What are the local attractions? Do you have menu items named around that? Hmm, interesting. When we saw that in some breweries that we went to, some of these local bespoke craft beers that are named after local politicians creates a huge amount of goodwill when that politician is super popular. They’re pretty simple things to do. Working with local sporting clubs. Amazing talking to people who are using, they’re giving away the voucher for the local football club or soccer club, whatever it is. The interesting thing is you give away a meal for the kid, the problem is that the family’s got two or three kids and they all get a meal and the parents are going to get a meal as well. So that free voucher that you gave away, that’s valued at $10 it ends up generating $40 worth of sales. And on top of that you’ve introduced a new family to your restaurant. What’s your retention rate going to be with that? If you’re collecting their email address that’s the perfect opportunity to take a new customer and turn them into a repeat customer. How have you gone with blurring the distinction between the local bar and your restaurant? Can you have a happy hour there so you can get the people in as they finish work. To come in and have a drink, have a few nibbles and then head home. Sharing tables, all of these sort of things, I think that these are going to be one of the really, really interesting spaces people play in as they try, because this will really, really sticky customers. They want to meet the people they know and they’re the people that they met through your restaurant. They’re going to be at your restaurant leveraging the social networks of the people in your restaurant that’s going to be a powerful trend I think. Now, they have got a very poor website, there’s nothing on the menu and it’s really just Indian. There’s nothing wrong with that, but that will not make me go and say, “Wow! This is completely awesome.” So, it’s not super amazing food, there’s nothing super amazing on the menu. And they aren’t doing any of their own marketing. They don’t have an email database. They don’t have any Facebook campaign, they don’t do anything like that. There’s nothing there that would drive me to use them as a loyal customer. Now the problem for them, is that it converts them from being in command of their own business to being price takers. So whether they’re using Groupon, I think we may have seen the end of Groupon. I’m not too sure what you’re seeing but were seeing much less Groupon activity on the websites we could look after. I think the Groupon thing has sort of fallen by the wayside. What we are seeing a lot more of are the online ordering companies running these specials, which you don’t have to partake in but if you don’t partake in them they send emails. And I’ve seen these emails, saying were running a special in your area! You have to offer 35% off for the whole week to all of your customers. Now, you can do that and then you’re losing a straight 35%. You pay commission on top of that which I think is absolutely madness. You don’t get the customers email address or you cannot do that. How many orders are you going to get when everyone else is offering 35% off. They drive that same market everyone in that area. Wow! you can get 35% off of your meal. So, these guys are really working hard at cutting their costs so that they can be a little bit cheaper because when you’re in one of these ordering platforms, then cost is one of the big differentiator that don’t do anything to get the message out that makes your menu unique. It’s really just these are the menu items, these are the cuisines, these are the costs and these are the offers they’re doing. They need to be as cheap as possible to be competitive. And, this is why we’re getting that divergence. Compare and contrast to a lot of the people who are out there charging really good prices for their food because of the fact that they’re actually in control of their own business plan. And whether it’s the marketing that they’re doing or the way that they’re structuring their menu, there’s something a little bit different about them. They put out that little bit of extra effort to not just be a cuisine-type restaurant. So, I think that’s going to be the really big one. I don’t think that there’s anyone going to be left in 12 months. It’s going to be really, really hard to be just that normal Indian restaurant you will have been forced down the price curve and look I’m not saying that there’s anything wrong with that. I’m just saying I don’t think you want to be going there knowing full well about how you’re going to need to do things: it’s going to be volume, it’s going to be discounts from suppliers, it’s going to be the way you market through these intermediary platforms. They’re the kind of things that you need to focus on and there’s probably good money to be had there. It’s going to be really tough though, I think because a lot of people, that the issue is that, it’s the default setting for a lot of people. And they’re led down that path without actually knowing that they need to be super low cost. Then they realise, we can’t make these numbers work because you’re competing against people who have done all of the hard work to make those numbers work. They can sell 10, 15, 20% cheaper than you. They can run their business on those margins, can you? That’s the really big question. You’re going to be forced down that and into a, either making no profit running at a loss, which is a nightmare scenario, to be putting so many hours and not actually getting an economical fortune for it. Or spending some time sitting down and coming up with a plan to be able to do that. Divergence is going to be a big thing. I think it’s going to be really hard to run that average restaurant, which I think is sad. They’re the kind of ones that I like but people are going to have to up their game as far as the menu goes, as far as the experience goes, as far as the kinds of things that you want to appeal to, to your customers. Otherwise, you’re just going to be one of those cheap restaurants trying to rely on volume to keep your head above water. So, what does that mean for you? There’s a couple of things, the first thing I think is, Education is absolutely critical in running a restaurant these days. You really need to understand that it’s not just about the kitchen, it’s just not about front of house, there’s a whole heap of other things that you need to be doing. You need to be building an awesome culture because that’s part of the product that you’re shipping out. You’ve got to be really on top of the costs. You’ve got to be really on top of the marketing so one of the things that we did, is I’ve done a blog article about the best restaurant podcasts for 2016. There’s a few awesome restaurant podcasters out there which and I think everyone should be listening to. So, we’ve got some of our podcast in there, you know one of the saddest things, one of our most popular podcast was “9 Common reasons why restaurants fail” and I think that’s because people can see it’s getting harder and they want to say one of the things that we need to avoid, that’s really sad. We went through our most popular ones. We’ve got the ones, we’ve got podcast from Eric Cacciatore, from Restaurant Unstoppable. He is a legend, goes interviews all of the smart restaurant owners gets the so many pearls of wisdom or knowledge bombs as he calls them. I like to think of myself as being pretty upbeat, he makes me look positively flat. He is the most upbeat person in the world that I know. Epic guy, have a listen to Restaurant Unstoppable and we’ve got some of his best ones their core values at the forefront with everything you do with Cameron Mitchel. Some of the stuff he’s done is really amazing. Smart Pizza Marketing so Bruce Irving some really good ones here. Yes, you might not run a pizza restaurant (See: Things working on Facebook for Pizzerias )but hey a lot of the stuff is transferrable. He does some really smart stuff. Quite technical marketing type stuff really, really clever guy. The guy I’ve got a lot of respect for Roger Beaudoin from Restaurant Rockstars, been a chef for a long time really knows his way around the kitchen. Really knows how to run a profitable restaurant. His podcasts are nice and quick, in and out very quickly so it’s easy to listen to his podcasts and just pick up one or two things that you need to make it worthwhile (See : Wobbly Tables Wobble Your Customer – The Solution Once and For All). And Ken Bergen from Profitable Hospitality, he’s got heaps of podcasts out there. We’ve got three of his best ones, “How to improve the gross profit in a bar.” These are the kinds of things you’ve got to be thinking about. Are you making as much money as you can be out of your drink menu. I’ll include the links to that in the show notes. Have a listen to this podcast I know I’ve been preaching to the converted here, but one of the big things is tag a few of your friends in who are running restaurants and not listening to podcasts because I think you need to educate yourself. And the big thing about podcasts is that you can listen to it while you’re doing prep, while you’re driving to work, all of those sort of things. You don’t have to, we’re not asking you to find an extra hour in the day. It’s an hour that you’re already spending time on and I think that’s the real key thing about it. The other thing you have to think about is your marketing plan. When I say think about your marketing plan, I’m not saying “oh, think about running a Facebook ad!” That’s not where you start your marketing plan. Your marketing plan starts way back at the start. Who is your target customer? why are they going to buy from you? There’s a hundred restaurants out there that I can go to tonight, tell me why, tell me why you appeal to me? So many people go, “Oh, we cook Indian food.” Everyone cooks Indian. Well, all of the Indian restaurants cook Indian food, tell me why. So Tulsi in Somerville. A. the food is ridiculously good. B. they have their own winery. And they do Shiraz and its some of the nicest wine that I’ve had in a restaurant. If were looking to out for a really, really nice Indian meal obviously and that’s the way that we drink. I like to have Indian every Friday night. When we’ve got Indian there’s a bottle of red sitting right next to it. That’s the way that we like to have our Indian food, really good Indian food with a bottle of red and he has got some awesome wine there. He can clearly tell you why people go and eat at his restaurant and it’s not “We cook Indian food ” He has gone that one step further. That’s your marketing plan. And he’s quite successful, he doesn’t do that much marketing. If you’ve got a great marketing plan, you don’t need to do as much marketing. It’s a lot easier to get a new customer than to become a regular customer. It’s easier to get that new customer in the first place, because people go “Aww, that resonates with me! Aww, that restaurants targeting me. I like that stuff.” So, have a think about it, then start looking at the free tools that you can be using. Confluence, we’ll probably go through a tools podcast I think it’s probably time we do that. What is Confluence and why is it epic? How do you use Slack? With some of our customers I’m in their Slack teams. They’ll just hit me up, James how do we do this? Some of these guys aren’t even in Australia. They’re putting a question out there and it will involve 3 or 4 people in their team. They just hit up on Slack and go. We’re having these communications this is how you can get people across multiple locations or even just people in your location who you’ll never get to see on the same shift. This is how you create communication with them. Obviously, the Free Online Restaurant Booking System, the Free Restaurant Online Ordering System they’re going gangbusters. because of the need for people to be able to build their databases. Over the next 12 months were going to be building out The Free Restaurant CRM system that’s going to be super cool. Because already the feedback that we’ve got, people, not all our customers read our emails. They go aww, what’s this new thing. So we say we sent an email about it. Oh, I missed that. what is it? They’re amazed to be able to see, because we’re starting to really help them visualise who their customers are, who are the important customers and how they can get those customers coming back on a more frequent basis. That’s super exciting. So hopefully you got something out of that. This s what we are seeing to be already starting to filter through we think that they’re going to be amplified in 2017 and beyond. They’re the kind of things you that really need to start to think about. So, have a think about them, have a listen. Let us know have we missed the boat on this the other things that we’ve missed. What is it that’s important for you because I’m trying to do this for a global audience so obviously there’s going to be some differences between some of the areas. UK, US, Canada, some of these things are going to be a little bit different. Can we hear from you what is it that you’re saying, what are the problems that you’re saying? And how can we help. So, Happy New Year! Let’s hope that 2017 is a much more exciting year than 2016 was. So, more profit, more importantly the thing we’re driving for, for all our customers that were hoping to be able provide is to enable you to be able to cut back the hours that you work. Too many people work too long in the restaurant industry and that’s the big thing, that’s our big new year’s resolution is to really double down on the work that were doing to enable you to be able spend more time, take a holiday maybe. How many of you have taken a holiday? Now here near enough, spend some time with your family. You probably do have a family they just never get to see you. They’re the things that we want to focus on. So that’s it. Have an awesome day, have an awesome, you already had new year’s. Hope it was an awesome New Year’s Eve for you. we’ll talk to you soon. Bye!